Symbiosis SET 2018 (सिंबायोसिस अंतर्राष्ट्रीय विश्वविद्यालय प्रवेश परीक्षा): The Symbiosis International University conducts the entrance test for the admissions in various courses of the University. The aspirants can apply online for the SET Application Form 2018 in the month of February. The deadline for the submission of the form is in April. The authorities will release the form on the official website. It is necessary for the students to submit the form and appear in the entrance exam to get successful Symbiosis Admission 2018. The students seeking admissions in the Symbiosis University have to submit the SET Registration 2018 as soon as they can. The last date is not announced yet but it will be in the month of April. 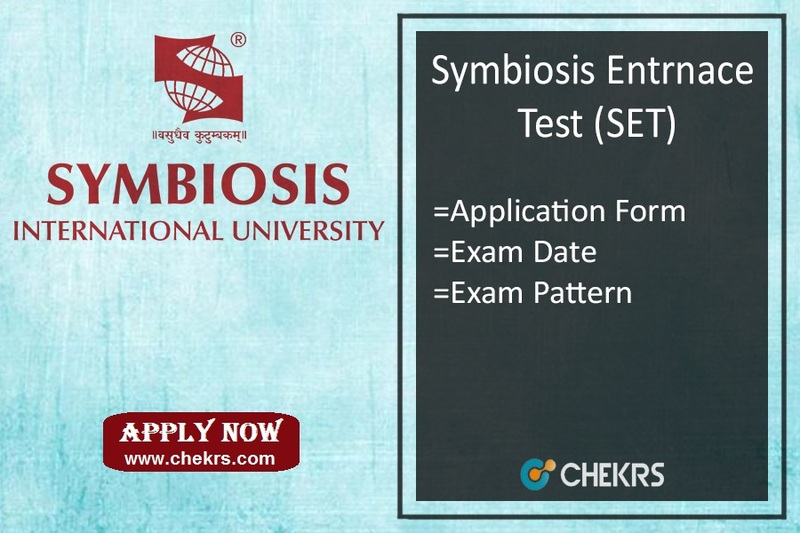 We will provide here the direct link for the submission of Symbiosis Application Form. They just have to follow some precise procedure for the submission of the online forms. Steps to submit Symbiosis Online Application form 2018. Then click the apply online link and open it. Enter your all valid personal details in the desired spaces. Now attach the scanned copy of the Photograph and signature along with the form. Pay the required application fee via any below given modes. Submit the form after payment by clicking on the proceed button. Also, take a print for the exam purposes. The aspirants have to pay Rs.1500 for the Application Form. The fees can be paid through credit/ debit card. Also, it can be paid through Demand draft or cash. Aspirant passed/ Appearing 10+2 (any stream) Or equivalent diploma from a recognized university or Board. They must have scored minimum 50% marks in aggregate. Passed/ Appearing 12th exams in any stream with minimum 45% marks (40% for SC/ST candidates) from any recognized board. Candidates who have appeared the qualifying examination and results are waiting are also eligible to apply. Such candidates are required to submit the passing certificate at the time of admission. Passed 10+2 with Physics, Mathematics as compulsory subjects with any one of the Chemistry/Biotechnology/Biology/Technical vocational subject. Attained at least 45% marks (40% in case of SC/ST) in the above subjects. BBA Candidates must have passed 12th from a recognized board with minimum 50% marks (45% marks for SC/ST candidates). 10+2 pass from any branch with minimum 50% marks (45% marks for SC/ST). Foreign Nationals (FN), Persons of Indian Origin (PIO) & NRIs must apply through the Symbiosis Center for International Education (SCIE). NRI candidates appearing final 12th examination in India are also eligible to apply. BCA Passed 12th examination or diploma in engineering/technology with minimum 50% marks (45% marks for SC/ST category candidates). B.Sc. Economics (Hons.) 12th passed in any branch with minimum 50% marks for general category and 45% marks for SC/ST category candidates. Number of Questions: Varies according to the paper. Negative Marking: There is no negative marking in the exam. The students have to check the Symbiosis SET Syllabus for the information regarding the topics which can be asked in the exams. The syllabus includes various subjects and topics according to the 11th and 12th class level. The syllabus for the general exams is General Knowledge, Analytical Reasoning, Reading Comprehension, Logical Reasoning etc.